The state of Rio Grande do Sul isn’t lacking for big football clubs, but Sport Club Internacional undoubtedly leads the pack. During its rich and varied history, Internacional has claimed three Brazilian League titles, one Brazilian Cup, and two Copa Libertadores trophies. Their rivalry with neighbors Grêmio -- often referred to as Grenal -- is considered to be one of the fiercest football derbies in South America. The restorated Estádio Beira-Rio in 2016. The club was founded in 1909 by the three Poppe brothers: Luis, Jose, and Henrique. Being of Italian descent, the brothers were unable to find another club to play football in -- the only two clubs in the city were reserved for those of German ancestry. The Poppes decided to name their new club Internacional, signifying that it was open to people of all origins and nationalities. International’s first great squad was formed in the 40’s, and it was mostly known for its all-out-attack style. During this period, the club won no less than eight Rio Grande do Sul championships, earning the nickname “Steamroller.” The main reason behind this superiority was that the Colorados had no qualms about adding black players to their squad, solidifying their reputation as the people’s club. 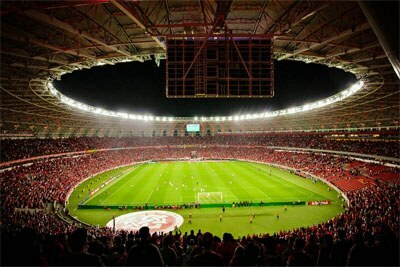 By the end of the 60’s, Internacional moved to the newly built Beira-Rio stadium, which paved the way for some of the greatest years in the club’s history. In 1975, they claimed their first Brazilian League title by defeating Cruzeiro 1-0. Thanks to keeping the core of that squad, Internacional managed to repeat this feat the very next season, winning 19 of 23 matches. The club capped off the decade by winning their third league title in 1979, outlasting Vasco da Gama 2-1. This time around, the team didn’t lose a single one of their 23 matches -- an achievement that no Brazilian club had matched until then. The following decades saw Internacional stay near the top of Brazilian football, but additional silverware was proving hard to come by. Still, the club reached the Copa Libertadores final in 1980, finished runners-up in the Brazilian championship in 1987 and 1988, and won the Brazilian Cup in 1992. In 1984, International had its whole squad called up for the 1984 Summer Olympics, where they helped Brazil win the football silver medal. Internacional entered the new millennium modernizing all its departments and focusing on their youth categories. This approach paid off handsomely, as the club managed to win its first Copa Libertadores title in 2005. Along the way, the Colorados had to overcome reigning champions Sao Paulo and former champions Nacional. Hot on the heels of their triumph, Internacional defeated the Ronaldinho-led Barcelona to win the 2006 FIFA Club World Cup. The 2010 Copa Libertadores proved to be an even bigger challenge, as Internacional barely scraped by Estudiantes in the quarter-finals thanks to an 88th-minute goal by Giuliano. After two other close victories over Sao Paulo and Guadalajara, Internacional became the fifth Brazilian club to claim a second Copa Libertadores title. Since the beginning, the crest has kept its features rather intact. The stylistic "SCI" initials have been on every version, with slightly modified letters. An updated crest in 2009 added an outline with the name on the team plus the year of establishment.